Physical Therapy for Shoulder Pain | Podiatry Associates, P.C. The acromioclavicular (AC) joint may need a Mary Poppins-esque level of diction to easily pronounce, but it is a very important piece in upper body mobility. A connection of the clavicle (collarbone) and acromion (part of the shoulder blade), this small joint at the top of the shoulder serves as the only real bony attachment of the arm to the rest of the skeleton. When the surrounding ligaments are damaged in either an acromioclavicular sprain or acromioclavicular tear, proper treatment and rehabilitation will be essential in restoring strength and full range of motion to the joint. An acromioclavicular sprain is most frequently seen in sports or jobs that involve high amounts of force, although car accidents and falling objects can also cause the injury. A blow to the tip of the shoulder, either from falling upon it or receiving a direct impact, can be enough to stretch or tear the ligaments to varying degrees. Symptoms of an acromioclavicular tear or sprain will include shoulder pain that might also radiate down the arm or into the base of the neck. 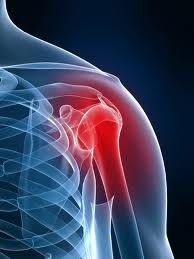 There will also likely be a noticeable bump that makes the sprained shoulder look different from its unaffected partner. Weakness of the shoulder and a limited range of motion tend to be observed as well. The severity of the sprain is graded on a scale from I-VII depending on the damage to the ligaments and any separation of the joint. A grade I acromioclavicular sprain involves only some overstretching of the ligaments. A grade II sprain involves some tearing of the ligaments and mild displacement of the joint, whereas a grade III sprain involves full tears of the ligaments and dislocation of the joint. Grades IV-VII are even more severe, but very rare. A minor, grade I shoulder sprain will be treated with the use of a sling and an easing into strengthening exercises. Pain medications and the application of ice may also be recommended, and normal activity can often be picked up again in one or two weeks. A grade II injury often requires a greater degree of physical therapy due to the increased level of damage to the ligaments. A special type of harness might be prescribed to hold the collarbone in place while the ligaments heal. Recovery time will be longer than in a grade I injury, but normal activities can often be resumed in two to four weeks. A grade III injury can be more “on the fence” with regard to treatment. In some cases, a sling or strapping may be recommended. In other cases, however, surgery to realign the joint may be seen as a better option. Injuries of even higher grades will almost always require surgery. In all of these cases, physical therapy will be an important element of the recovery plan as the time to fully heal increases. Some early physical therapy can be performed, but more intense therapy can often not start until about six weeks following surgery. An acromioclavicular sprain may keep you on the sidelines for a while, but Dr. Jennifer Molner and the staff of Castle Pines Physical Therapy can organize a rehabilitation program that will help you reclaim your shoulder strength and mobility for the future. Schedule an appointment with our Castle Pines, CO office by calling (303) 805-5156.